The ability to understand, analyze, manage, store, locate and share knowledge is at the heart of any modern organization’s ability to successfully grow the business. The proliferation of content, and its growth in speed, volume, variety and location are critical factors that must be addressed in order to make information actionable and stay competitive. Some of the world’s largest organizations in Manufacturing, Telco, IT, Utilities, OEM and others have chosen to deploy Cogito, Expert System’s cognitive technology for knowledge management, customer support, corporate intelligence, risk mitigation and robotic process automation. Cogito understands the meaning of words in context the way that people do. Through an in-depth analysis of content of all types, Cogito transforms data into actionable intelligence that can be leveraged across the organization to extract business value from the information available. Cogito is more than just a software: It’s a key component for any organizations to discover insight, transform customer engagement and empower decision-making processes. Cogito improves knowledge management processes, making information searchable and shareable with the speed and precision required to analyze information on a large scale. Cogito helps companies access and use all of the information available to support their most strategic activities, increase and share insight, grow revenue and improve productivity. The secret to providing an excellent automated customer support experience is a deep and clear comprehension of the customer’s request in their own words, and personalized and intuitive services (chatbots, automated Q&A, virtual assistants, etc.) available on any device, anytime. Implementing an information infrastructure for customer support is essential for ensuring access to information customers need, across your knowledge bases. Cogito helps organizations streamline access to support, whether it is delivered directly to customers, or to support staff who help customers who need additional assistance. Cogito supports organizations in leveraging any and all information to gain intelligence on the market and on competitors. This includes social media. Rich insight extracted from social media can be used to identify trends, build a 360-degree view of customers and competitors, and inform better decisions with real-time intelligence. Monitoring thousands of sources to identify risks before they become threats is of great value for your risk management strategy. Information impacting global assets or your supply chain such as violence, natural disasters, disruptive innovation or external forces that influence the market are events that you need to know about today. Cogito help organizations identify the right information at the right time. 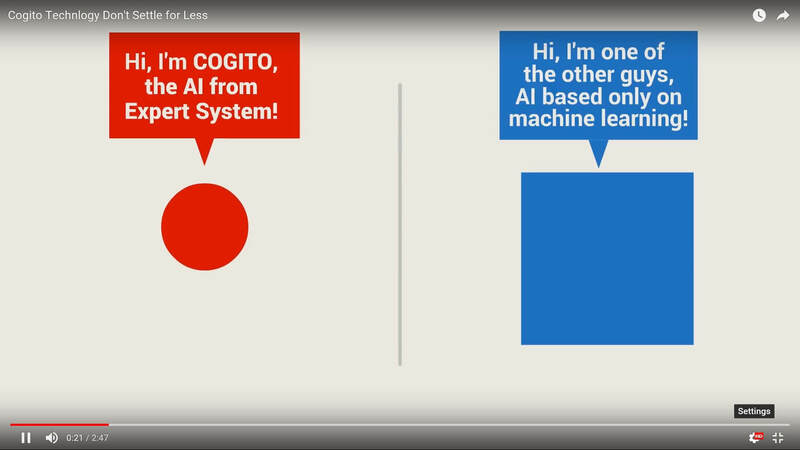 The cognitive computing features of Cogito enable automation of a variety of time-consuming and complex activities. The intelligent automation of claims management, compliance and legal review, policy underwriting, contract integrity, fraud detection and customer interaction delivers measurable ROI in the form of reduced costs and quality improvements while ensuring faster, more accurate processing every step of the way.